Joseph Edward (Daniel) Patz, school portrait, 1966. Joseph Daniel Patz was born on December 25, 1948, at Our Lady of Victory Hospital in Lackawanna, New York, USA. 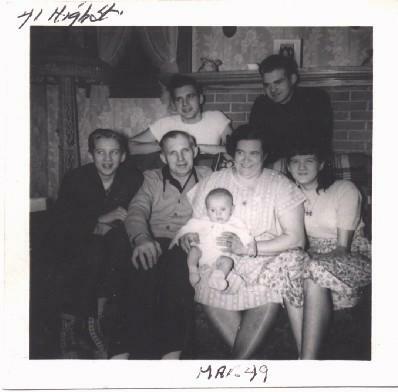 Joe was the youngest of six children of Bernard George and Barbara Lorissa (née Lander) Patz. For reasons for which we are not quite certain, Joe changed his middle name to "Edward." While in high school, Joe worked part time in a television repair shop in Angola, New York, where he developed an interest in electronics. On June 1, 1968, Joe married Margaret (Peggy) Ann Jones, daughter of Edwin Paul and Isabel (née Brown) Jones. Joe served from 1968 to 1978 in the United States Air Force. He was stationed for three years in Germany, and later at bases in the United States and overseas. Joe earned various degrees while in and out of the service. These included a Bachelors degree in business administration at Grand Canyon College, a management degree, and a Masters degree in telecommunications at the University of Colorado-Boulder. Joe also received an anthropology degree while in Arizona that honed his skills in archaeology with his interests in ancient Indian artifacts and sites, plus old fort and mission sites. During his free time, Joe would volunteer to patrol these sites to protect them from theft and damage, plus to help identify and report artifacts. Joe also was a certified flight Instructor and his flight Instrument rating for flying. From 1983 to 2002, he worked for the U.S. government, primarily in computer programming and later in the the planning, installation, and maintenance of computer systems. 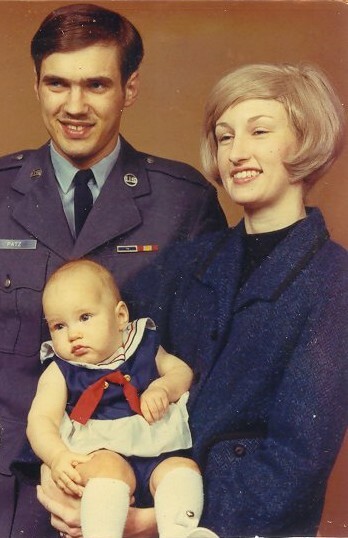 While at Fort Huachuca in Arizona, Joe became a civil service employee and worked for the government in places like Panama and at Fort Richie, Maryland. During his final years, he was working in Germany. During these times, his marriage to Peggy ended in a divorce. On August 2, 1996, Joe married Irene Louise White. The couple traveled extensively all over Europe. He once told me that he was hoping to be able to live in Spain when he retired because he liked it so much there. One of his last wishes was his ashes be spread around the Arizona desert that he had helped patrol. Joe died on September 5, 2006, in Heidelburg, Germany. A memorial service was held for him on September 24, 2006, in Fairfield, Pennsylvania. Aside from his daughter Heather, Joe was survived by two stepchildren: Jason Young and Sherry Burst. 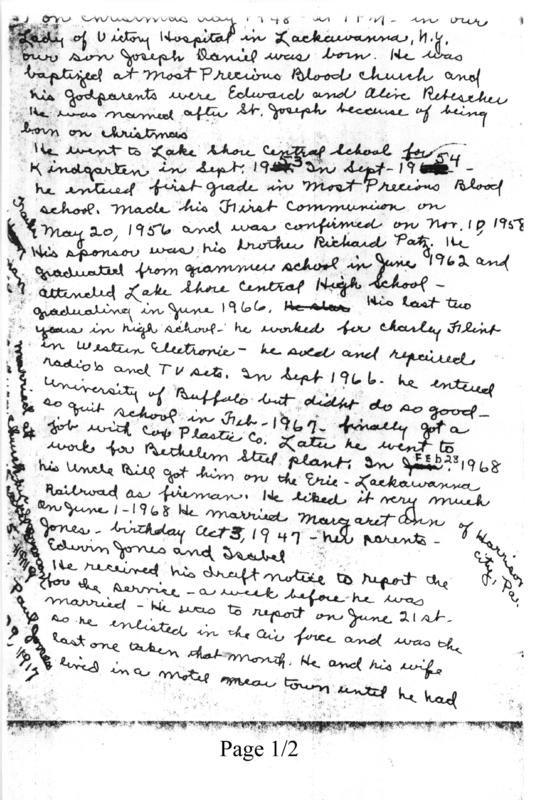 Text written by Bernard William Patz, brother of Joseph. 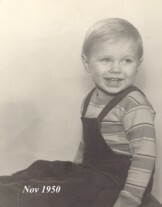 Joseph Edward (Daniel) Patz, November, 1950. 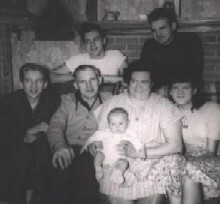 Sittng left to right: Richard James Patz, Bernard George Patz, Barbara Lorissa (née Lander) Patz holding Joseph Edward (Daniel) Patz (born Christmas 1948), and Mary Barbara Patz. Back, standing: John Oscar Patz and Bernard William Patz. 41 High Street, Angola, NY. March, 1949. 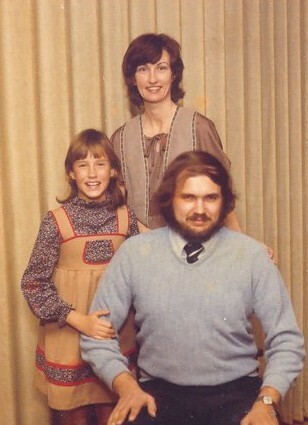 Joseph Edward (Daniel) Patz and Margaret ("Peggy") Ann (née Jones) Patz, with their daughter Heather. 1970. Joseph Edward (Daniel) Patz and Margaret ("Peggy") Ann (née Jones) Patz, with their daughter Heather. 1979. 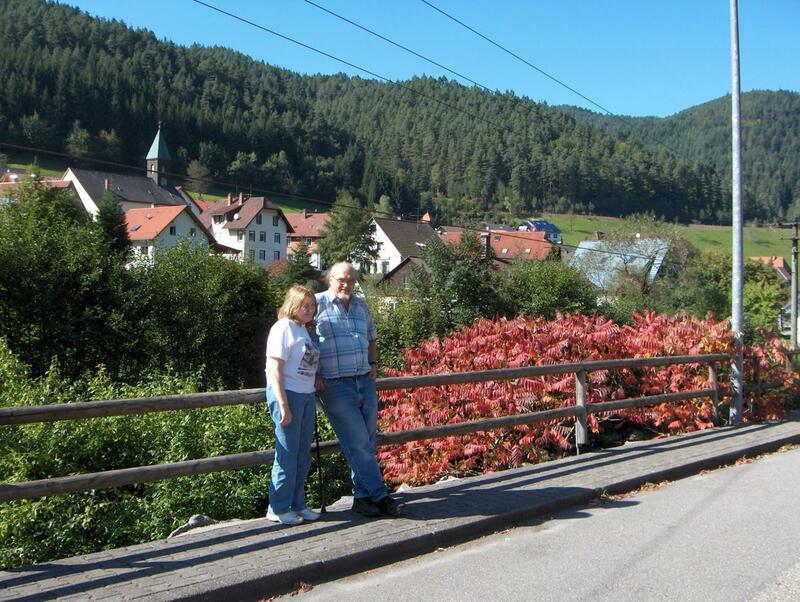 Joseph Edward (Daniel) and Irene Louise (née White) Patz, Black Forest, Germany, 2005. 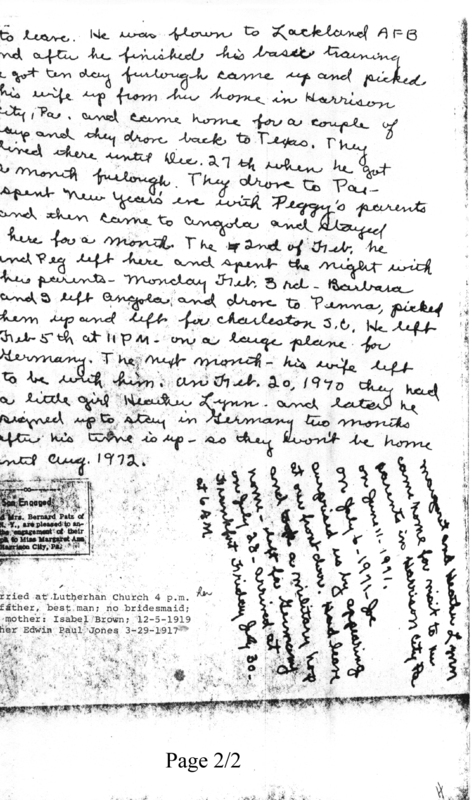 Notes from His Mother: Hand-written notes on birth and early years of Joseph Edward (Daniel) Patz, as written by his mother, Barbara Lorissa (née Lander) Patz. 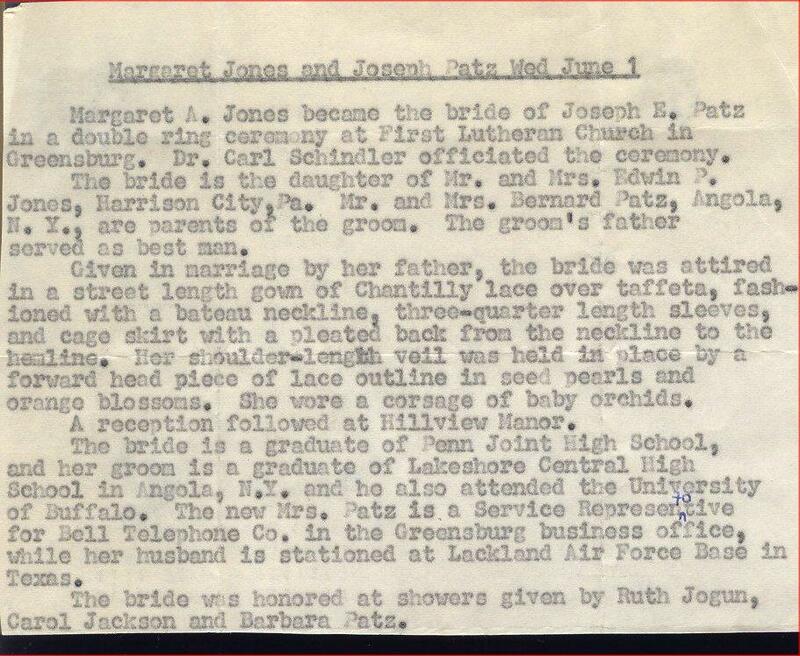 Wedding Announcement: Joseph Edward (Daniel) Patz and Margaret (Peggy) Ann Jones, June 1, 1968. Memoriam: Joseph Edward (Daniel) Patz, died September 5, 2006.